Open channel monitoring refers to the measurement of water flow in streams, rivers and water races. For irrigation and environmental management it is important to be able to measure how much water is flowing and how much is available for extraction. Unlike flow in pipes, which are of generally uniform size and shape, open channel flow is highly variable due to the irregular shapes of natural water channels. Controlled water races provide extra complexity as gates are opened and closed affecting water levels. 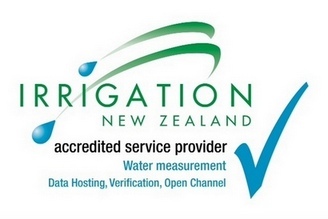 Scottech have been carrying out open channel flow monitoring since their establishment over 40 years ago, and are very familiar with the challenges of New Zealand flow monitoring. There are several solutions for open channel monitoring depending on the nature of the water course being measured. This may just be a basic manual gauging site for or may involve highly comlex real time flow monitoring technology. Includes the establishment of a manual water level monitoring site and development of a look-up flow rating curve. This features the establishment of a Basic Flow Monitoring Site, with the addition of a HOBO Water Level Datalogging System for continuous measurement. Data is downloaded manually to a laptop and converted to flow. A high quality level and flow monitoring Campbell Scientific system, with automatic conversion of water level to flow. Telemetry options available.